We recently completed a family getaway at one of our favorite natural spots, just over 1.5 hours east of Vancouver, BC, via Highway 1.… Harrison Hot Springs has long been a little hideaway, growing with popularity over the years.… When we started going there 10 years ago, it was quiet, picturesque, and really a treat.… Over the years its popularity has grown, hosting festivals and events, booming the little town that could.… Nestled between the mountains on the lake, the views are breathtaking. One of our favorite things to do is grab an ice cream and stroll the lakefront at dusk. You have many choices on accommodation when you go, from quaint hotels with a lake view, to the historic Harrison Hot Springs Resort and Spa.… Rich in history, the hotel dates back to 1926, and the hallways lined with old photos of the hotel.… I love seeing these photos and the changes over the years. Strolling the grounds this weekend, I noticed a Red Oak Tree that had a placard “Planted by Clarke Gable.” Something I never noticed all the times I have been there, definitely a neat piece of history. 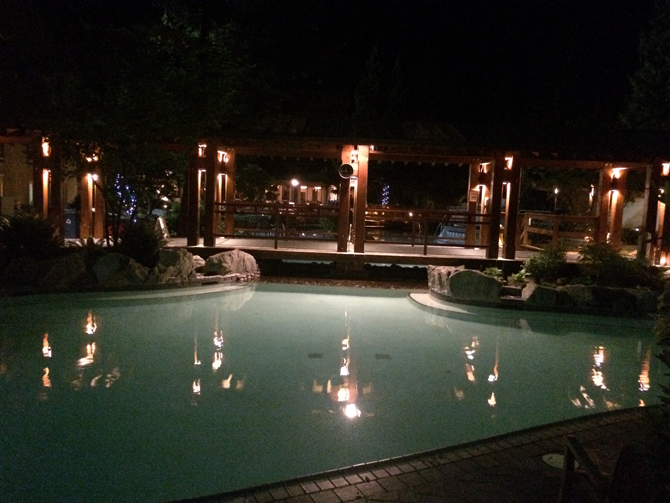 We love the 5 mineral pools, and the shallow main pool for our daughter.… The adult only pool is also a lovely choice if you are just there to relax as a couple, a girlfriends getaway, or want to sneak away for a few moments of peace. We have stayed in many rooms there, and this last time, we chose the Garden Walk Out. A 10/10 in my opinion!… It was my husband, 5-year-old daughter and I. The garden walk out was perfect, with 2 queen beds, a small beverage refrigerator (all rooms have them), and our own small patio, which leads directly to the pools!… Bonus, we could sit in the adult pool adjacent our room, see our room, and let our 5 year old curl up in bed and watch Netflix.… The front door had a top lock on it, unreachable for preschoolers, and we could see directly into our room, 5 feet away.… Ideal! If you are looking for more space, we have booked a family room before.… These rooms boast tons of space, and are in the main hotel.… Some older bathroom furnishings (think vintage) but lovely and spacious. The rooms are separated; with an adjoining door and each room has their own TV.… Think TEENS!… It is ideal. 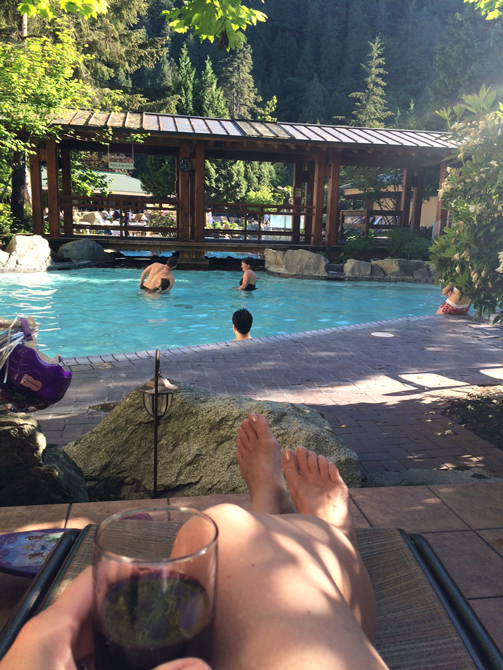 The Harrison Hot Springs Resort and Spa now gets a ton of traffic each weekend, and the rooms have a high turnover.… On a long weekend or a special occasion weekend, such as this past Mother”™s Day, expect it to be busy. 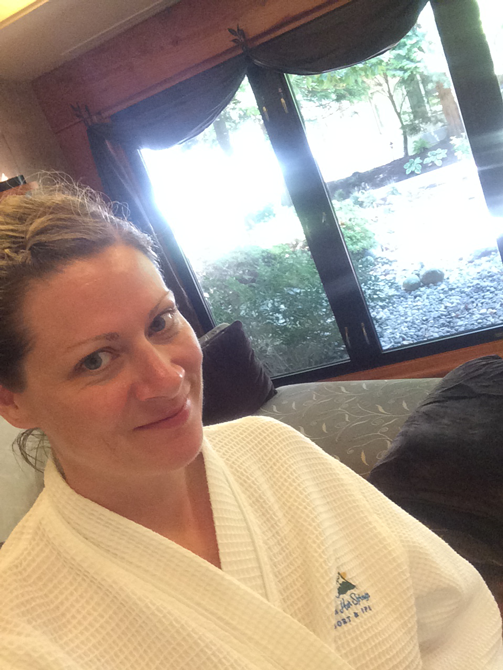 OH-LA-LA-SPA: Immerse yourself at the Healing Springs Spa.… This past weekend I was lucky enough to spend a HALF day at the SPA on site. Yes, you heard me.… I must have been a good Mom!… It was their half day package.… Truly magical. The staff are well trained, and the spa tranquil. Book ahead to avoid disappointment! BOOKING YOUR ROOM: There are not a ton of discounted deals out there for this hotel; they do offer a discount for BCAA (CAA for our USA visitors) and a senior”™s rate. Check out Hotels.com for the best rates before you book. FAMILY MONEY SAVING TIP:… I always pack our own breakfast (easy stuff, such as cereal and fruit) and all our own snacks and beverages.… It saves a TON on food, and everyone seems to like to just graze.… I make a cheese, sausage, pickle and cracker plate mid afternoon for a snack.… Gobbled up every time.… I have a collapsible cooler I take, and I take my own disposable cutlery, plates and bowls, along with my own cutting board and knife.… Oh, and don”™t forget your corkscrew as well! 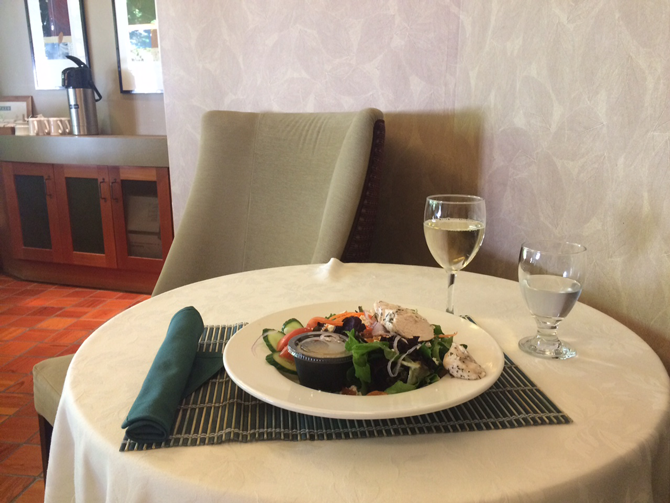 The pool area is a glass free area, so pack your own wine glasses for the patio! 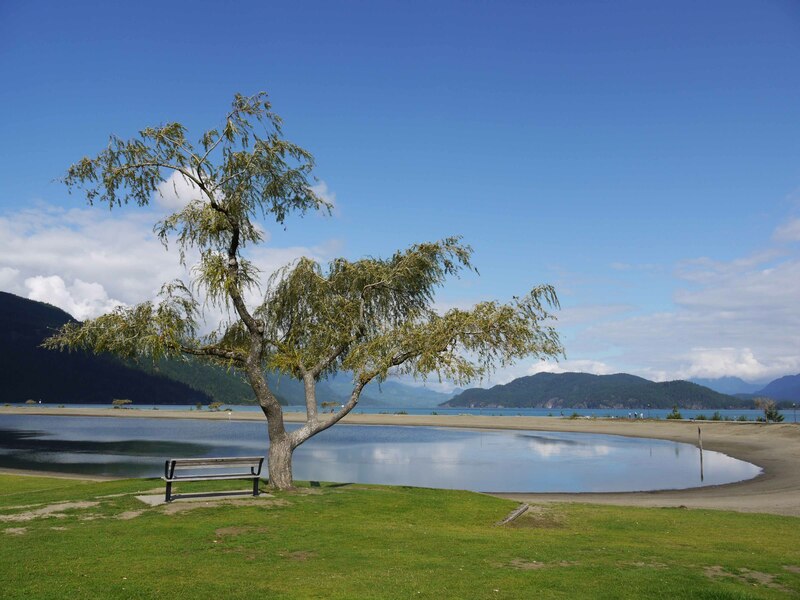 WHAT IS ON AROUND TOWN: Before you book, check out what is on around town.… Some great festivals take place in the summer and fall.… There are some great hikes around the lake as well. WHERE TO EAT?… There are lots of choices on the strip.… We love to order in, relax, eat, and back to the pools.… One of our favorites is Village Pizzeria ”“ delicious!… It gets busy, so call ahead, walk 5 minutes, pick up your pie, and enjoy! We have also ordered from the local Chinese restaurant, and they deliver with a min order value. … We have eaten on site at the restaurants. 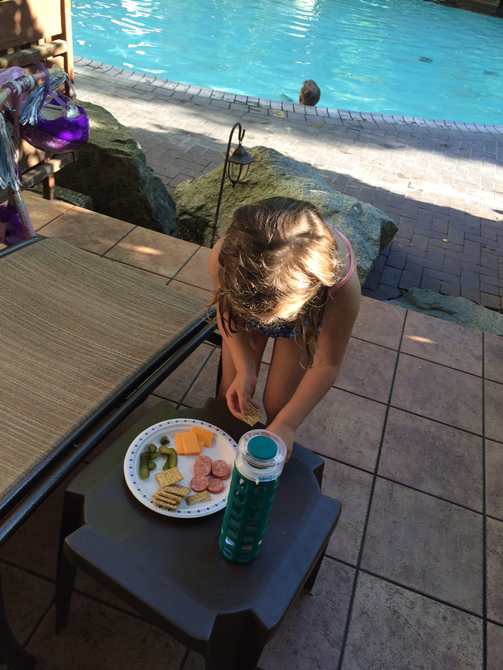 They are pricier, and with our 5 year old, we just prefer to kick back, enjoy the weekend, and just share a pizza. It is much more economical, and not one needs to get out of their swimsuit! 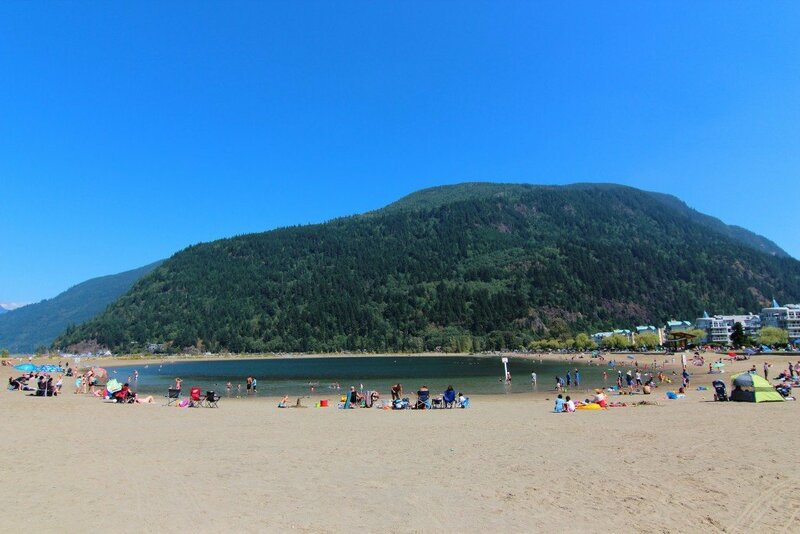 If you are looking to go this summer, do not delay!… The hotel fills up quickly.… Enjoy your stay in our little slice of heaven at Harrison Hot Springs. 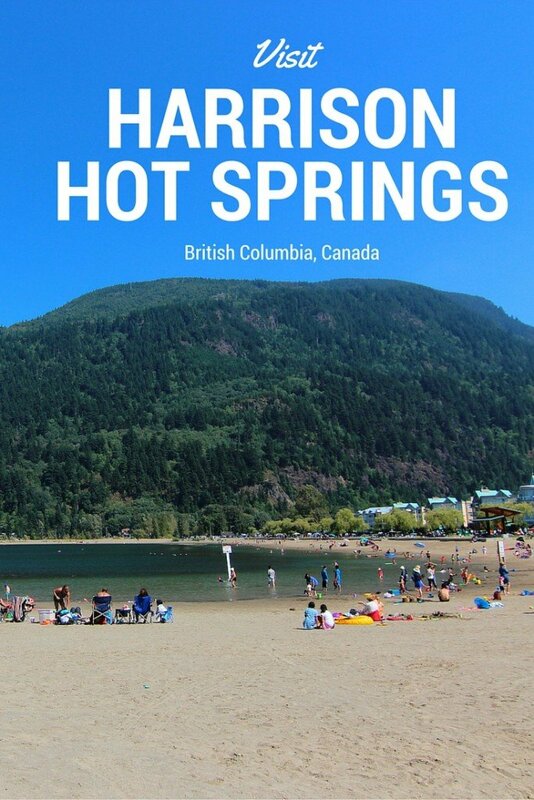 You can hover over this pinnable image (or any image on my site)of Harrison Hot Springs Resort to quickly… pin it… ! Christi Manson is a full time professional and married Mom to a spunky 5 year old daughter. Christi lives in the suburbs of Vancouver, Canada with her family, and spends time day dreaming and planning the next getaway adventure! Wow, this looks like a really awesome place to vacation. The views look amazing. It looks like a beautiful place to visit. 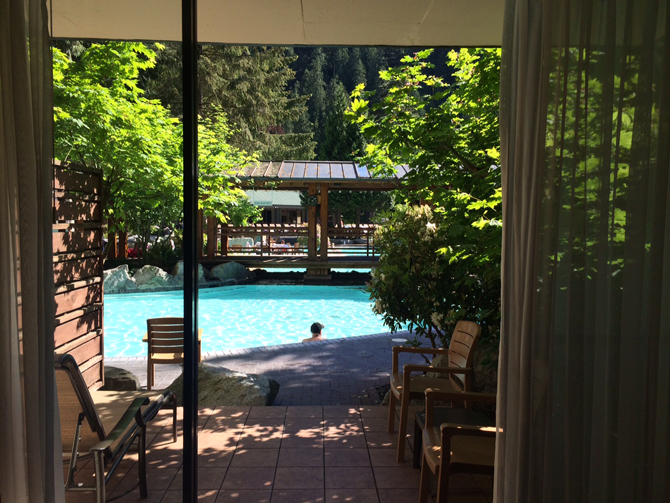 I’d like to leave my kiddos with their dad for awhile and enjoy the Healing Springs Spa. I absolutely love BC! We spent nearly 3 weeks there last summer exploring and I can’t wait to return. I had no idea there were hot springs there, however. This sounds like a lovely weekend escape – especially if you get a half-day spa package!! it is definitely a great way to spend a weekend! This looks beautiful! We’ve yet to make it up to BC, but I’ll definitely keep this place in mind when we do. A half day at the spa sounds amazing!! I would love to visit one day!